The Scottish Thistle - Beautifully Bold! But although it may look familiar, you probably don't know the legends that surround it's adoption as a national Scottish emblem. A humble weed might seem an odd symbolic choice, but really what could be better than a native-born plant which is as bold as it is beautiful? There's a rich history and several legends surrounding the thistle, and we'll take a closer look at some of it right here. 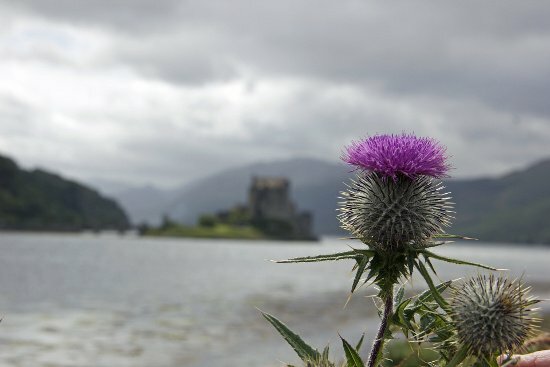 The Scottish thistle is a resilient little weed has always bloomed across Scotland's landscape, but it wasn't until the 13th century that it's place in the country's symbolism and written history began. Unfortunately for these unwary invaders, one of their soldiers bare feet came down hard on a Scottish thistle and his cries of shock and pain were enough to wake the sleeping Scots. 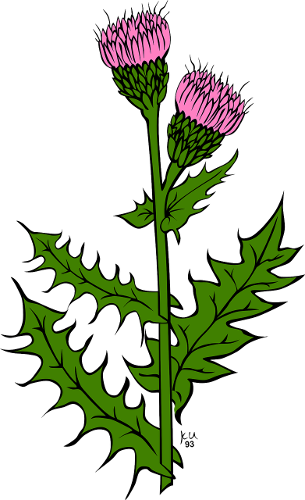 Legent has it that because of the heroic role the plant played in the outcome of the battle, the thistle was immediately chosen as a national emblem. It appears on silver coins that were issued in 1470 during the reign of King James III (1466 - 1488), and early in the 16th century it became an integral part of Scotlands' Coat of Arms. In 1503, the marriage of King James IV of Scotland to Princess Margaret Tudor of England, seems to have been the inspiration behind the poem entitled 'The Thrissil and The Rois' ('The Thistle and The Rose') penned by the Scottish poet William Dunbar. The thistle represented King James and the rose represented Princess Margaret. Toward the middle of the same century, historians believe that Scotlands' highest chivalric order was founded by King James V (son of King James IV), it's name was 'The Order of The Thistle'. The official motto of this organization is'Nemo me impune lacessit', this Latin translates into 'No one provokes me with impunity' (or in Scottish-English ' Wha daur meddle wi' me?' 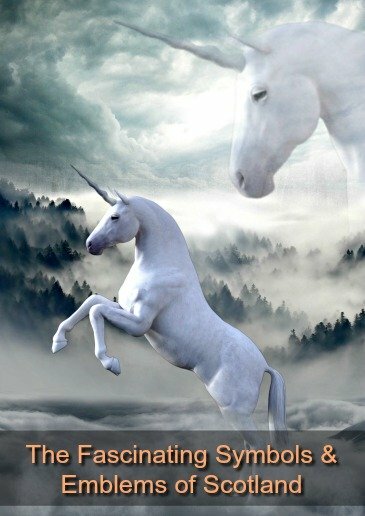 ) which ties in perfectly with the original legend. Interestingly, it's possible that this order had much older roots, because some historians believe that James V was reviving a much more ancient order, one that perhaps dated back as far as the early 9th century. In which case the thistle would have been represented in Scottish symbolism even earlier than it's debut as a defender of the realm in the Viking v Scots battle at Largs. 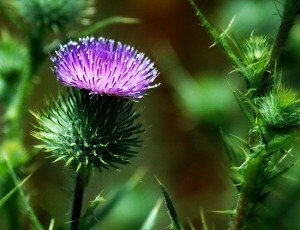 Today the Thistle is seen on everything from sporrans and jewelry to soap and tea-towels, and it's a Scottish symbol recognized all over the world. That little weed has come a long way! This biennial plant (which means it takes two years to complete it's lifecycle) is also known as the 'Cotton Thistle', and it's Latin name is 'Onopordum Acanthium' . The 'basic' growth of leaves, roots and stems takes happens during the first year, the plant flowers during the second year, and then dies. Luckily thistles reseed easily and new plants will spring up around the original every year. In fact, anyone who's actually encountered the Thistle will tell you that it 'grows like a weed', and that's the truth! During it's second year, this Thistle can grow up to eight feet in height, and over four feet in width. When you realize that, in spite of the soft downy flowers, the bulk of this plant is covered in extremely sharp thorns, you can imagine just how impressive (and dangerous) it can be. If you've ever stepped on a thistle, you'll have some sympathy for the poor Vikings in the legend above. Probably because it's a weed, but the this plant also has a very stubborn and invasive root system, and removing the entire plant from a piece of ground is not an easy task. If you miss just a little bit of the root, you'll find the thistles come back in force the following year. We think these physical attributes make the hardy and beautiful thistle the perfect Scottish Emblem, don't you? There's something for everyone - including YOU!